CARGO, the successful Bristol food and drink hub made from shipping containers, is to be extended by more than three times its current size as it continues to attract an eclectic mix of retailers, bars and restaurants. The first of 49 containers arrived on site this week to make up the second phase of the scheme at Whapping Wharf, Harbourside, one of the city’s most significant property developments of recent years. Some 38 of the containers in CARGO 2 will be occupied by businesses – giving fledgling food and drink firms and retailers the chance to take space and enhancing Bristol’s reputation as a foodie city and home to fertile ground for independent retailers. 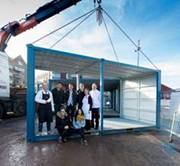 For a number of those now occupying containers in CARGO 1 – which has been open only a few months – it was their first permanent unit after trialling their offering at festivals or in pop-up bars and shops. The new units in CARGO 2 will mainly include shopping on the ground floor and restaurants above. They are being installed next to CARGO 1, which includes 18 containers and is home to Woky Ko, Chicken Shed, Shambarber, The Mighty Quinns Flower Emporium, PIGSTY, Bristol Cider Shop, BOX-E, Lovett Pies and Corks of Cargo. When complete, the Wapping Wharf community, Bristol’s newest harbourside quarter and one of the city’s most significant developments, will include over 600 new homes as well as a range of independent retailers. Mokoko, Better Food, Bertha’s Pizza, Little Victories and Wild Beer Co are already open along Gaol Ferry Steps, with Biblos and Fig 1 due to open soon. JLL is the agent acting on behalf of Umberslade for retail lettings at Wapping Wharf. CARGO 2 is due to open in early 2017. · Mabboo. An independent Bristol-based retailer specialising solely in clothing and accessories made using the world’s most sustainable plant, bamboo. · Gambas. The sister restaurant to Bristol’s favourite tapas bar Bravas, it will be specialising in prawns, seafood and authentic Andalusian tapas. · Salt & Malt. Michelin-starred chef and restaurateur Josh Eggleton will open a second Salt & Malt, serving signature gluten free fish and chips, as well as holding popup events and tasting menus. Salt & Malt Cargo will include an outdoor terrace with stunning views of The Matthew and Bristol’s Floating Harbour. · The Athenian. The Athenian is a street food endeavour following in the steps of traditional Greek souvlaki. · John Kelly 1880+. Selling design-led jewellery, silver and metalware, circa 1880 to the present day, with a slant toward post-war Scandinavian and British design. · Pure Yoga. Pure Yoga will be offering lunchtime express classes as well as early morning and evening classes for all levels. · CUPP Bubble Tea. CUPP specialises in authentic Taiwanese bubble tea and noodles. CARGO will be CUPP’s third opening in Bristol. · The Pickled Brisket. Bristol’s first dedicated salt beef bar, serving locally-sourced hot salt beef sandwiches. · Oliver’s Ice Cream Ltd. Oliver’s is coming to CARGO with a proven track record in making artisan Italian ice cream (gelato) and sorbets from almost entirely natural ingredients. · Loop Massage. A small, perfectly formed oasis of calm, offering bespoke, affordable massage to the frazzled people of Bristol. · TARE. A 20-cover restaurant, with a menu regularly changing throughout the year allowing the team to work with the season’s best local produce. · Story @ Cargo. It aims to become the neighbourhood butchery and take-away dedicated to using whole animals as much as possible, raised responsibly, often organic and always free-range. · Roots Manuka. Roots Manuka will offer well-researched, healthy products. · Pizzarova. The second fixed site for Pizzarova, which opened 12 months ago on Gloucester Road, selling delicious, fast, sourdough pizzas. · Big Juice. providing nutritional, freshly-prepared fruit and vegetable juices and smoothies.